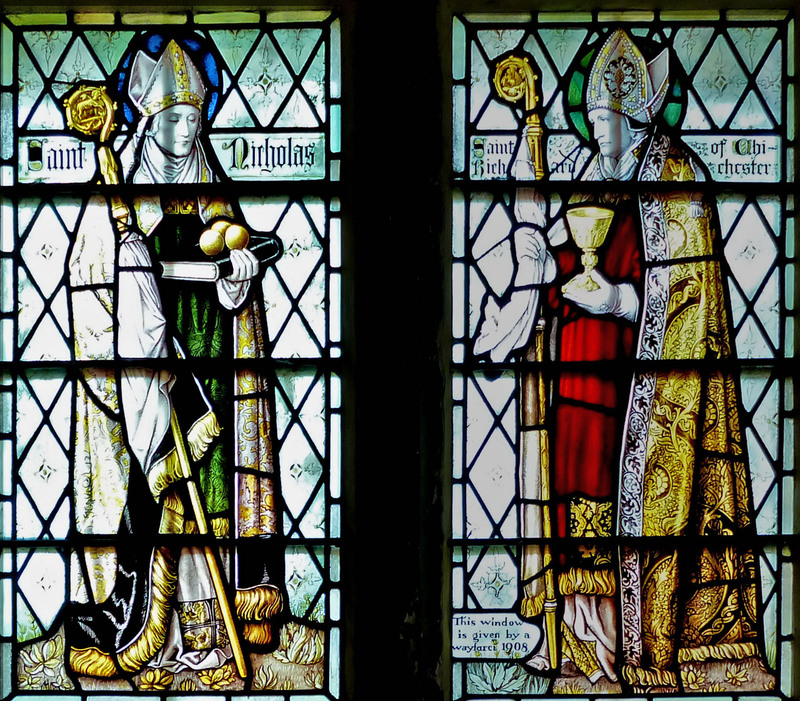 St Nicholas (left) and St Richard of Chichester (right), 1908 (inscribed on the right-hand corner of the right-hand light), by Shrigley & Hunt, in the west end of the south cloister at Chichester Cathedral. St Nicholas is shown bearing three golden balls on a Bible. These represent the life-changing gifts that he is reputed to have given to a poor man, allowing the man to marry his three daughters to good husbands. St Richard of Chichester was a thirteenth-century bishop here, famed for his reforming zeal and courage. His tomb here became a place of pilgrimage. With the deep colours and rich patterning of the two saints' robes, and the pair's dignified bearing and intent expressions, the window is a lovely example of the "good design" for which this firm was known (see "Shrigley & Hunt (1874-1982)." — Jacqueline Banerjee. Photograph by Eleanor Price, with formatting by Colin Price. Our thanks to the Dean and Chapter of the Cathedral for permission to reproduce it here. You may use this image without prior permission for any scholarly or educational purpose as long as you (1) credit the photographer and (2) link your document to this URL in a web document or cite it in a print one. Eberhard, Robert. "Stained Glass Windows at Cathedral." Church Stained Glass Windows. Web. 12 September 2018. "Shrigley & Hunt (1874-1982)." Gwydir Lliw Nghymru: Stained Glass in Web. 12 September 2018.